Union midfielder Ilsinho (25) celebrates his goal against FC Dallas with C.J. Sapong (17) and Fafa Picault during the first half at Talon Energy Stadium in Chester on Saturday. In a must-win against one of the league's best, all it took was a heel flick from Ilsinho in the 17th minute to push the Union back into the Eastern Conference playoff picture. The Union's 31-year old midfielder, known for his technical ability, spun a nifty feed to an incoming Haris Medunjanin, who slotted an effortless cross to C.J. Sapong for an early lead against FC Dallas. 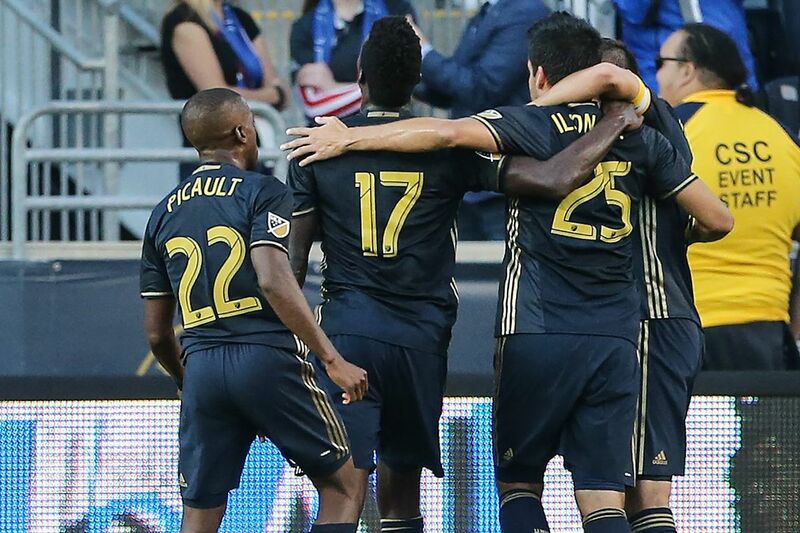 It was the first of many plays from Ilsinho, who tallied one goal and two assists to help the Union cruise past FC Dallas, 3-1 on Saturday night at Talen Energy Stadium. The Union, 8-10-5 (29 points), are three points behind Columbus for the Eastern Conference's sixth and final playoff spot. "It was probably the best sequence," Sapong said. "It was fun. We were clicking and that's the most connected goal we've had all season. It was just a beautiful thing to be a part of. Moving forward, these last few games are very important and this is how we'll need to play." Ilsinho started the run by dribbling past a pair of FC Dallas defenders and eventually handing possession to Chris Pontius, who kept the play alive for Medunjanin to create a give-and-go scoring opportunity with Ilsinho. "Every day, we try something different at practice," Ilsinho said. "Some days it's good, some days it's terrible. But we have to try, because they turn into passes like today." Ilsinho padded the Union lead to 2-0 in the 22nd minute, as the Brazilian found the bottom left corner from 18 yards out on a one-time strike. The ball found Ilsinho after a long throw-in from Pontius and an FC Dallas deflection. "His talent is undeniable," coach Jim Curtin said. "The things he can do with the ball, players are scared to get close to him. You've seen it in flashes in games, but when he plays at his level for 90 minutes, his talent is unique. He's a difference maker, and tonight it added up to goals and assists." The final tally came in the 68th minute as Sapong cleaned up the initial shot from Ilsinho, as FC Dallas goalkeeper Chris Seitz allowed an easy rebound finish. Sapong's second goal of the night — and career-high 12th of the season, was the finishing touch on a victory fueled by desperation. The must-win label, given in August to a team with 11 games remaining, is rightfully due with the Union's road struggles. Curtin's club is 1-7-3 away from Talen Energy Stadium — and after Saturday's victory, is 7-3-2 at home. Lost in the applause for Ilsinho's performance were nine saves from backup goalkeeper John McCarthy, who made his sixth start as the injured Andre Blake recovers from an injury that required stitches in his right hand. McCarthy once again provided the Union a resilient effort against a speedy Dallas offense, which struck in extra time as Michael Barrios scored past the flailing McCarthy. In the first video review in Major League Soccer history, a Dallas goal was overturned in the 81st minute after a foul on McCarthy was committed during the play. Having taken advantage of a much-needed opportunity at home, the Union will enjoy a week of rest and face the struggling Montreal Impact (24 points) on Saturday night.